Making a departure from traditional drive architectures in its new P2lean generation of machines, Salvagnini the world's leading manufacturer of panel bending machines is using distributed servo amplifiers for positioning, instead of keeping drives installed centrally in the control cabinet. 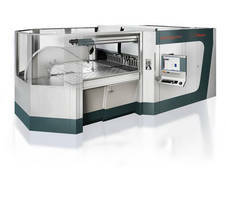 And with this solution, the new Kollmorgen AKD-D series generates cost savings throughout the whole value chain. Replacing the central hydraulic pump by a synchronized network of electrically-driven servo actuators. Using a central structure with control cabinet converters, the shielded cable between the motor and the drive and the cable for the feedback system previously could have needed laying up to 10 meters of cable. For the seven positioning axes that would have made a total of 140 meters of wiring (14 wires of 10 meters each). With this solution, using a central AKD-C power supply module in the control cabinet and seven distributed servo drives in two groups with three and four axes, this has now been reduced to only 40 meters. The total length is calculated as follows: two hybrid cables with power supply and feedback between the power supply module and the two nearest drive cables for a total of 20 meters, plus three meters for connecting the three axes in the first group and four and a half meters for a further three axes in the second group, knowing that the average distance between the IP67 devices in the system is not more than one and a half meters. The power supply to the motors then has to be considered. They are also installed not more than one and a half meters from the distributed AKD-N servo drives. Because the Kollmorgen solution is equipped with its innovative single cable connection technology, only 7.5 meters more cable is needed. Considering only the use of the distributed AKD-N servo drives combined with the single cable connection system, this saves 100 meters of cable - by reducing from 140 to 40 meters or roughly 71%. The other benefits of distributed servo technology are not inside the machine itself, - but in the control cabinet. Now that the drive's heat loss no longer has to dissipate behind closed doors, the cost of cooling the cabinet is reduced. This produces two knock-on effects: firstly a smaller-scale and consequently cheaper cooling system and secondly, improved energy efficiency as a result of the control cabinet's lower energy consumption. Savings of 30 percent have been estimated by Kollmorgen in real applications.